I've been trying to find this publication for quite some time now, but it seems I'm having bad luck. Is it really so rare that it never shows up on eBay? New Eye and Intergalactic also don't list it in their catalogues, and even the various SF book-sites give only sparse information. 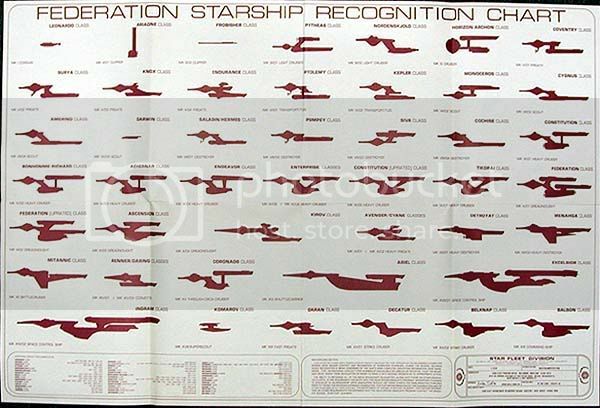 I may be mistaken, but (according to the Starship Schematics Database) the Charts are the source of a number of SotSF-related ships, like the Monoceros and Nordenskj�ld. I also know a number of people around here have it. So.. how the hell do I get my hands on the Charts? Does it have an ISBN number I can look up? Or is someone willing to sell ? I thought I had heard that the artist known as Aridas Sofia, who worked on it, still had some copies about. I could ask him for you, if you'd like. Any chance of a good scan of it? I'd love one for refrence. This the same picture that Steve Pugh posted last year. I've haven't seen a bigger pic. Thanks to a number of mails and PMs, I've just bought a copy from Starland. It's listed under Star Trek -> Posters. What in hell is that stem thing in the top left corner? Looks like a stove-pipe hat. I swear to god I refrained from making that joke! It actually says ARIADNE Class. Um...what in hell is it though?!? Hey: guess what I just got from a friend that's moving away? Jackhill's Fleet Refrence Manuals Vol-1-3 and "Starfleet Prototype" and "Ships of the Star Fleet vol. One Revised". I've never seen these before and they're in pristine condition! Man, these are cool...I never knew my pal even had these and he assumed I already had them snad almost threw them away! All things are cyclical - about a year ago we had a dicussion about this VERY object and went through ALL the objects (just about) on this chart. We sussed out (actually I did) that if you combine the first three ships - it makes the SS Enterprise. So the 'Ariadne' is actually just the silloutte of the ring section - but cause you don't see any detail - they just used it to make a new starship. It's a rough combo of the first three ships on that chart. As for Jackill's volume 3 - all of it. I have the first two and treasure 'em... But most importantly, I'm curious as to the other Excelsimbassador bashes were in the third book.